Physiotherapists warn lifting heavy seats can cause a pelvic organ prolapse in women. A fairly windy night with clear intervals and showers. Some of the showers will again be locally heavy with the chance of small hail. Strong westerly winds. Minimum temperature: 1 to 4C (34 to 39F). Tuesday morning will have sunny spells and a few scattered showers. Becoming cloudier in the afternoon with rain spreading up from the south. Fresh to strong south-westerly winds. A picture of the what the new grandstand at Plymouth Argyle's ground will look like has been revealed by the club. No date has yet been given for when the redevelopment at Home Park will be completed, but the club said there would be "outstanding banqueting and conference facilities to compete with the very best in the South West". Once completed, the match day capacity will be increased to about 18,000, bosses said. A394 Cornwall both ways severe accident, near Penhellaz Hill. A394 Cornwall - A394 Penzance Road in Helston partially blocked and queuing traffic in both directions near the Penhellaz Hill junction, because of an accident. Low-cost airline Flybe is moving forward with its sale to Connect Airways. Shareholders have voted in favour of the £2.8m deal with the consortium of Virgin Atlantic, Stobart Air and Cyrus Capital. The Exeter-based regional airline ran into trouble last November following a profit warning. Rory Cattermole's body was discovered using Snapchat Maps three days after he went missing. Paington Zoo faced a similar incident last year when another female tur escaped. 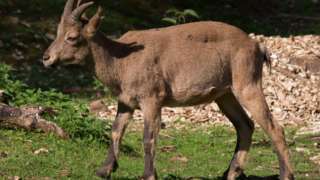 A goat-antelope has escaped its enclosure at a Devon zoo after getting "spooked" while vets worked on the herd. Keepers at Paignton Zoo said the young female West Caucasian tur cleared a fence on Monday, left its paddock in the old quarry and entered woodland "well inside the perimeter of the zoo". They added while the tur was not a danger, keepers were concerned for its welfare. The same species of animal was involved in a similar incident in September last year. The West Caucasian tur is a mountain-dwelling goat-antelope found in the Caucasus Mountains range between the Black Sea and the Caspian Sea and listed as an endangered species. We know that the best thing to do is to leave it alone, monitor it from a distance and wait for it to return to its enclosure. It is a shy and nervy animal. It is not large, it is not dangerous, but, of course, we're keen to get it back where it should be. It will be alarmed and disorientated and under stress, and we want it to be back safe with its herd as soon as possible." In Kennford, on the A38 at Haldon Hill, there's a broken-down car Plymouth-bound just after the Splatford Split. Drivers are asked to approach the area with care. A seahorse has been spotted in the Fal estuary - which is an "extremely rare" occurrence - according to the Cornwall Wildlife Trust. Marine officer Matt Slater said he was "amazed" when the female short-snouted seahorse came up in the dredge. He came face to face with it while helping on a survey of the Fal oyster beds being run by Cornwall Inshore Fisheries and Conservation Authority (IFCA). 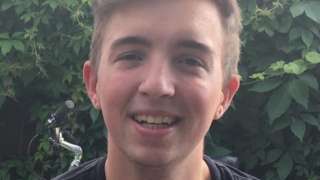 "I had heard that oyster fishers occasionally see seahorses but didn't want to even hope that we might see one as the chances are so small," Mr Slater said. "We were all amazed," he added. The annual oyster survey monitors the catch rates of oysters and other shellfish giving an indication of the health of the estuary. Finding a rare seahorse adds to growing evidence that the Fal estuary is still productive and in reasonable health, the trust said. A man and his dog have returned to St Agnes in Cornwall to thank the RNLI team that helped rescue the animal after it fell off the edge of a cliff last year. Mark Harris was walking on the coastal path near Portreath in November when springer spaniel Dexter fell about 229ft (70m) on to a beach at the bottom of the cliffs where he ended up "sprawled and unmoving". The St Agnes RNLI team was called to pick Dexter up after it was deemed too dangerous for the coastguards to rescue him from the top of the cliffs due to their "unsafe and crumbly nature". Luckily, Dexter recovered from the lung and eye injuries he suffered. On Saturday, the duo said a "personal thank you" to members of the rescue team. I am so grateful to the RNLI and the coastguard who assist people in difficulty all around the coast of the UK especially when the reason for the assistance is so needless. All I had to do was to have had Dexter on a lead and this would never have happened and the brave men and women of the RNLI and the coastguard would never have had to risk their lives." He added he would always "hold the team dear" for the work it did. A fire at a bungalow near Redruth is being treated as "suspicious", police have said. Crews from Cornwall were sent to Snakey Lane, Four Lanes, at about 05:30. No-one was injured but the bungalow was severely damaged. 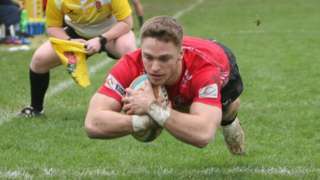 Cornish Pirates agree new contracts with back-row Matt Bolwell and winger Alex O'Meara. East Devon District Council hopes to be able to hand over its former Knowle headquarters in Sidmouth to developers by the end of March. Its new Heathpark headquarters in Honiton opened for business on 11 February but was officially opened in a ceremony last Wednesday. Children and teachers from two Honiton schools attended and lowered two time capsules into the ground containing a selection of objects chosen by the children - including local newspapers and magazines - to show today's fashions, future predictions, and information about rural village life in East Devon. The new headquarters cost the council £8.7m, while an additional £1.5m was spent on upgrading Exmouth Town Hall - where one third of the council staff are to be based. The Knowle has been sold to developers Pegasus Life for £7.5m, which has been granted planning permission to convert the building into a 113-apartment assisted-living community for older people. 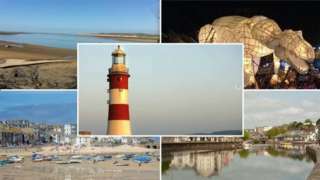 Richard Cohen, the deputy chief executive of East Devon District Council, said: "We hope to be out by the end of March, subject to the clearance process we are under taking at the moment." The front doors of two sports clubs were smashed in burglaries at the weekend, police have said. Holsworthy Golf Club was broken into between 02:00 and 07:30 on Sunday, while Bude Town Football Club was burgled between 18:00 on Saturday and 07:45 on Sunday. At both venues, the front doors were damaged after being smashed to allow access to the properties, officers added. A number of items were damaged and some cash taken during both incidents. A man was grabbed by the throat in an assault in Torpoint, police have said. It happened outside the public toilets - next to the Garden Sports Leisure Club - on Antony Road on 28 February - some time between 17:30 and 17:40. Officers said an investigation had been launched and it was believed there was a number of possible witnesses in the area at the time to the incident involving two men. A review of the "chaotic" changes to parking in Teignmouth is set to be undertaken. In March 2017, a raft of changes in the town were implemented, including introducing winter parking charges on the Upper Den carriageway and residents' parking zones in the town. But the decision has split the town, with some residents calling for the parking zones to be scrapped entirely, while others want them extended. Last week, councillors agreed a further review of on-street parking provision in Teignmouth is to be undertaken, subject to cabinet approving the funding. However, Devon County Councillor for Teignbridge Jerry Brook warned: "Any solution will have to be a compromise as, whatever we do, not everyone will be happy." A "crack house" in Newquay has been closed down and boarded up after there were concerns over Class A drug supply and antisocial behaviour at the property, police say. Officers said it was also being used as part of a so-called county lines network. Such networks see criminals from city gangs send dealers to rural areas. It's the second closure order in the town in just three weeks, and it has been carried out via a partnership between Devon and Cornwall Police, Cornwall Council and Ocean Housing - which owns the property. It means the flat on Hawkins Road is completely closed off to any person for three months. Officers said they were encouraging anyone with information about the supply of controlled drugs to contact them.